Holy cow! I thought I would try my hand at a couple of the challenges out there this week. Shouldn't take too long, right? Uh...yeah. So, after my first wacky attempt at the sketch, I decided to combine it with the color challenge for the week on Splitcoast: Not Quite Navy, Baja Breeze, and Kraft. 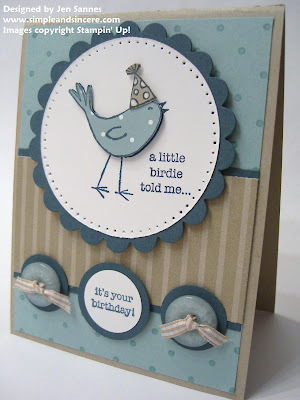 I immediately thought of this set - A Little Birdie Told Me - and wanted to use the scallop die with my Big Shot. And then I got stuck! It took me awhile to get this all together and I'm still not sure if I'm crazy about it - maybe there's too many polka dots. Can there be such a thing? Let me know what you think! I love your card! It's adorable! I thought the sketch was fun too. beautiful card!!! and never too many polka dots for me. i DID struggle with finding the right circle to go inside the scalloped circle (started CASEing this last night) - ended up using a nesties circle. i never got comfortable with the coluzzle. have not used this set in a year - thanks for bringing it out again cause it is a CUTIE!! !